I come upon examples of bad practice in publishing government data on a regular basis, but the Universal Jobmatch tool is an example so bad I just had to write about it. In fact, it’s worse than the old-fashioned data service that preceded it. That older service was the Office for National Statistics’ labour market service NOMIS, which published data on Jobcentre vacancies and claimants until late 2012, when Jobcentre Plus was given responsibility for publishing the data using their Universal Jobmatch tool. Despite a number of concerns, more than a year on, Universal Jobmatch‘s reports section has ignored at least half of the public data principles first drafted by the Government’s Public Sector Transparency Board in 2010, and published in 2012. This is why those principles are important for anyone doing research on issues of public policy (in this case, benefit claimants and the jobs open to them). 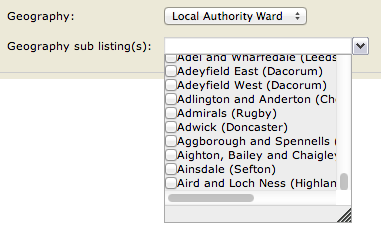 On Universal Jobmatch reports you can have data down to one particular district or ward – but you can’t have more than one at the same time, unless you want aggregate figures for the areas overall. A typical result when you ask for data on more than one area – note that the figures are aggregated rather than presented side by side. Instead, you will have to download them separately, manually, then add the name of the region, and repeat this however many hundreds of times you need to get all the areas you need. And then repeat again for each month – there’s no way of requesting more than one month’s data in any form. If you wanted a national picture broken down by ward for just one month this would involve 9,523 manual downloads. If you wanted to look at change over 12 months, you’re looking at 114,276 repetitive actions – before you get to the cleaning and merging. Well you can certainly download the data as CSV or XML – but again, only manually after you’ve selected your criteria. When people talk about ‘machine-readable’ they sometimes overlook the importance of machine-readable URLs. When you look at the Universal Jobmatch reports, the URL ends “Reports/Reports.aspx” whether you are on the reports index, the search page for one report, or the results page. In other words, there’s no way to link to the results of any search – or even the search page itself. A URL is computer-readable: ideally, it should be possible to generate a list which a computer might cycle through, grabbing the data. 15 months since taking over responsibility for the data, the DWP have yet to publish data on Jobcentre Plus on central data hub Data.gov.uk. The holding page for the data says it “Will be reviewed in the light of demand and prioritisation”. When NOMIS published the data, more was available, and it’s clear that the demand is there, as the consultation responses show. The consultation on moving the data from NOMIS to DWP received a long list of concerns – including criticisms of the consultation process itself. 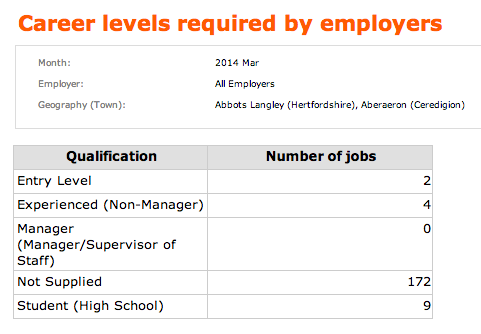 Despite having over a year to do so, few of these concerns appear to have been addressed in the Universal Jobmatch reports, despite a promise that “All points raised will be considered as part of phased planned improvements to the Universal Jobmatch MI [management information] Tool.” to be “available in Spring 2013”. There’s also one final problem with the report generation service: you cannot select any location starting with a letter in the second half of the alphabet. When it comes to wards, the drop-down menu only goes halfway through the ‘A’s before it is cut off. This entry was posted in data journalism, online journalism and tagged data, data.gov.uk, DWP, Jobcentre Plus, NOMIS, ONS, open data, Public Sector Transparency Board, Universal Jobmatch, World Wide Web Consortium on March 5, 2014 by Paul Bradshaw. 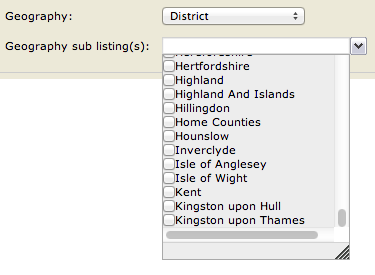 I had to use the UJ report finder today to do statistics for the Several Boroughs of East London and my oh my, was that a headache. Once completed I went back on the site to try access a final bit of report and it doesn’t even give me access! I really pray they fix that, even change it to NOMIS’s format as that is even easier to use and understand.